Earnings were fine,and the stock is selling off $1 in the after-hours. Oh my! Big deal. Same old play on this number after every earnings report. On July 31, the stock sold off after earnings to under 10, when Sheldon Adleson, when asked why they beat numbers jokingly replied that they were "cooking the books." I said you needed to take the stock on that pullback. And you could get it in the 9s. Check out the chart. Was that an opportunity on earnings to sell, or was it an opportunity to buy? 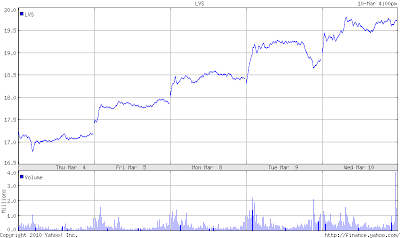 Now check out the 5 day chart on LVS. Who sold this number yesterday? What clown wanted you to think the market was heading south, and what clown wanted you to think the casino stocks were done? The same clowns who sold LVS on earnings! They're back! 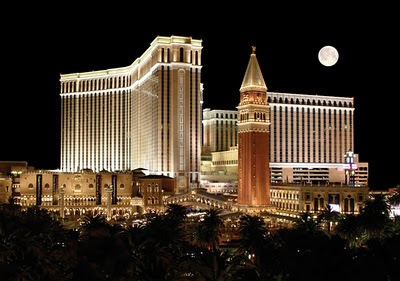 On April 27, Singapore Las Vegas (Marina Bay Sands) is opening. Yesterday, Singapore upped their growth forecasts. Won't that help? 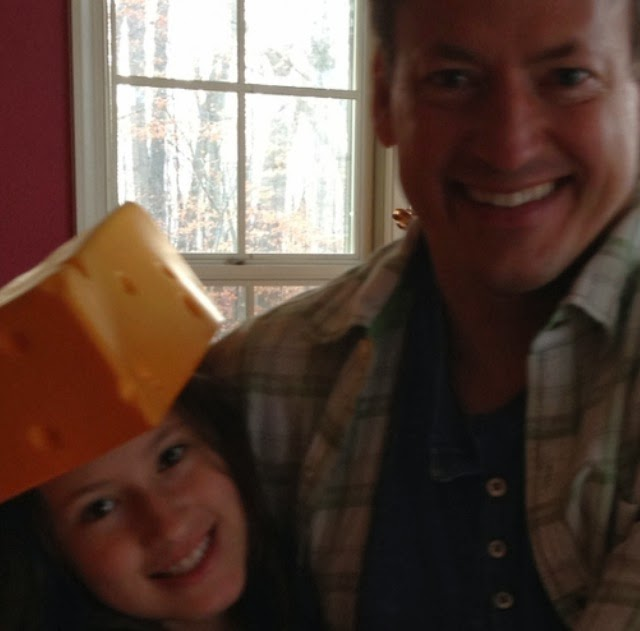 Last Friday, Sheldon told CNBC that the convention business in 2011 would be as good as 2007. Won't that help the stock? So who would sell? Just more Wall Street wimps! Who think they need to watch every tick on the screen, so they can pull the trigger and not lose any money. LVS is hitting the cover off of the ball in Macau. The tax rate their is 35% plus another 2% and 3% thrown Macau's way. Thagt's 40%. The tax rate in Singapore? Is that in the stock? And if the clowns want to sell it on the opening of the Singapore casino, doesn't that mean it has to go higher? How about 23 or 24. And fast! 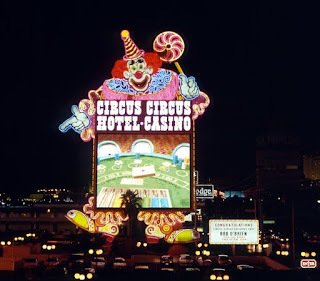 And last I checked, Las Vegas likes clowns. They just take their money! is MGM worth any play...they haven't moved that much compared to LVS?